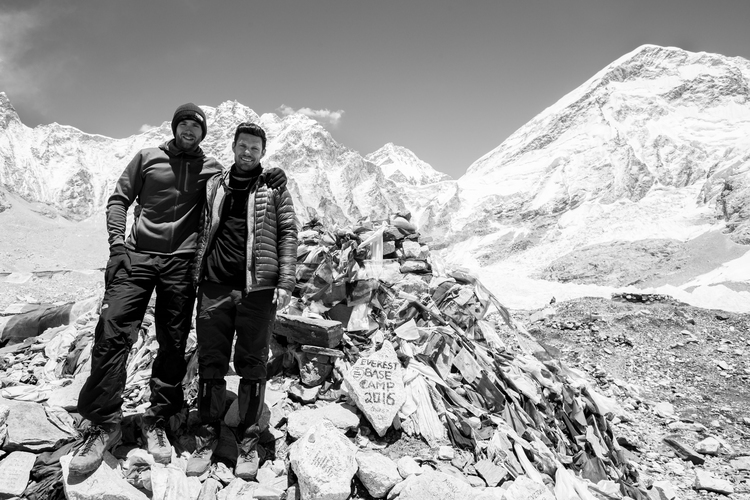 Everest Journal - Part 3 — NORTH BLOG. 16th May - Acclimatization & Rest day Dingbouche. One of those nights again that l didn’t want to leave my warm sleeping bag, l held on so long but l just couldn’t hold on any longer.. l finally gave in. One of the smartest/dumbest moves l have made this trip. As soon as l stepped out the tent it was as if l had just opened a door then walked right into an open galaxy, the night’s sky was breathtaking, l could see every single star it was stunning. I was blown away that much that l ended up staying outside for a few hours under the night’s sky taking in all the beautiful scenery, it was so breathtaking I didn’t notice the cold at all. Then when l decided to get back in my tent l was so cold that l could not warm up in the slightest, which ended up being the coldest & toughest night yet. Thank god it was our rest day the next day in Dingbouche as l felt incredibly tired. I was counting down the minutes until the sun started peaking in the Chukhung Valley so l could get up, enjoy some tea & a nice hearty breakfast. After breakfast Randeep said we will do an acclimatisation trek today to get our bodies ready for our trek tomorrow to Lobuche 4,930m. Back to the tent l go, hiking gear on & my Arcteryx Bora 2 mid leather GTX boots (Product Code: TISO-ARCT-1130165) which l have grown to love, these boots are the best l have ever had during my hiking days: extremely breathable; lightweight; great fit with zero blisters but the best part is the Gore-Tex insulated mid liner that can be removed & dries out extremely fast. We climbed 300 metres up one of the big hills just behind us. The acclimatisation trek was great, myself and a few others made it up to about 500m, we had sun the whole way with a nice breeze and were blessed with the presence of a Golden Eagle flying above us. 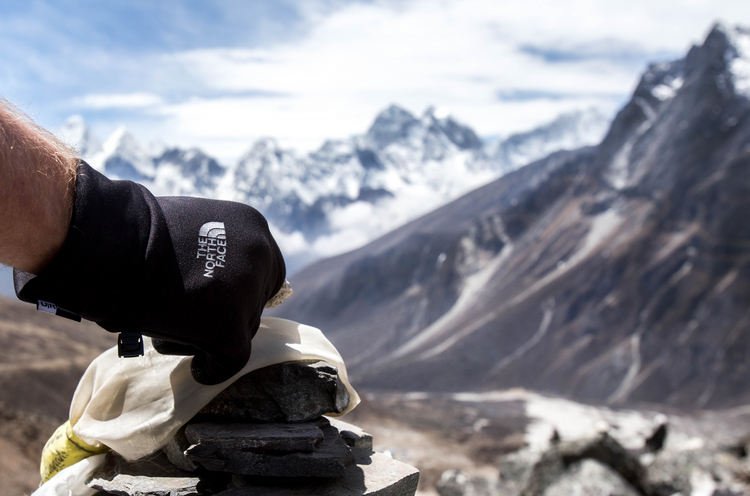 17th May - Hike to Lobuche. Todays trek to Loboche was difficult, the altitude was playing at it again. The walk was beautiful with views of Mount Pumori 7,161m, Lingtren 6,749m & Mount Changtse 7,543 which is in Tibet. 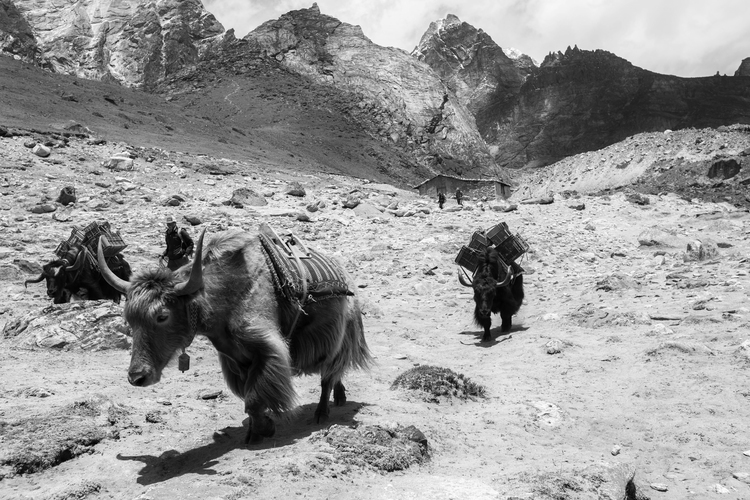 This part of the trek towards Lobuche was when I seen the most Yaks carrying supplies to & from Base Camp. Watching these animals carry huge loads is impressive but not as impressive when they are on certain parts of the trail that are extremely narrow, dangerous, steep & filled with loose rock. The whole time l have been on this trail l’m thinking how on earth do these animals manage it, but l suppose if there’s a will there’s a way plus the farmer is mustering them, constantly whipping them with a twig keeping them in check. One of the coolest parts of this trail & what l have noticed throughout the camp sites is that there is normally a good group of dogs who accommodate small villages or switch between a few. These dogs seem like wise people, whenever l was climbing a big hill, going for a walk or even a long trek to another local village there would always be these dogs within a close distance keeping us company. The animals on this adventure l have encountered all have a certain peaceful vibe they give off. I am used to coming from western society where animals are intimidated much easier so for me being around these peaceful animals was super pleasant especially the dogs. We arrive at a small town called Thukla gaining about 300m where we sit down for half an hour before our tough ascend to Lobuche. I know l have said it before but this is the toughest & most exhausting part of the trek yet especially with it being the 7th day, not having the best sleep, eating certain foods my body is not used to, trying to get as much energy as l can & having the altitude constantly trying to beat me. While l’m having this mental/physical battle with myself l can see that l’m almost over this steep hill. l finally make it up this hill filled with exhaustion but relief as l felt personally that this steep incline of about 400 metres was a true test of my will power. After making it to the top we reach a memorial ground of prayer flags & monuments dedicated to climbers who have lost their lives due to summit attempts in this majestic mountain range. I have a moment of silence & place a rock on one of the many Cairns at the memorial ground in respect to all the climbers who have been successful & unsuccessful. After a short stay at the memorial ground it’s time to bash on, we continue getting amazing views of the neighbouring mountains. After about 4 hours we finally make it into Lobuche, we have some lunch then a small 30-minute acclimatisation hike. 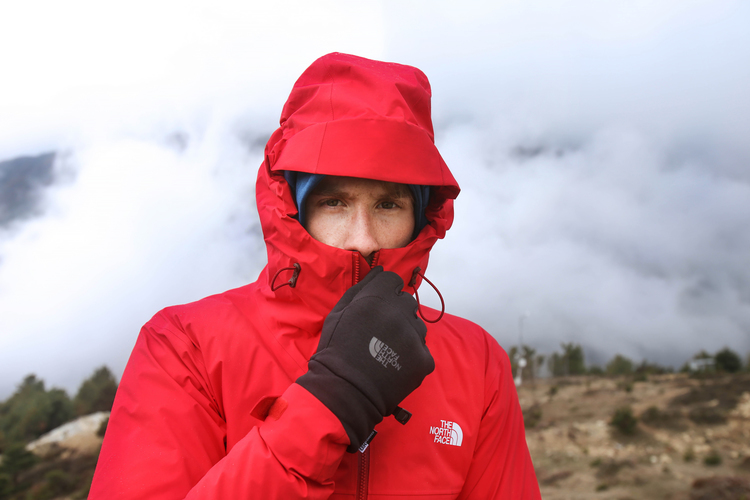 The weather is much colder at this height 4,930m, so l put on my North Face Canyonland jacket (Product Code: TISO-TNFX-1128280) that has been great for me so far keeping me not too hot & not too cold, protected from slight wind breeze plus the great hood prevents cold air going down the back of my neck. l also put on my North Face Etip gloves (Product Code: TISO-TNFX-1082818) which have been amazing for me keeping my fingers warm but also allowing extra comfort when wearing them rather than restricted movement you get sometimes wearing gloves. While acclimatising on the hill l quickly head back down towards the lodge we will be staying in for the night trying to warm up anyway l can making sure l get my body prepared hopefully for a great nights sleep. 18th May - Hike to Gorakshep. Waking up, looking out the window and seeing nothing but white was almost like waking up on Christmas Day when you’re a child, seeing what Santa has brought. I’m excited because it’s the first time it has properly snowed plus we are going to Base Camp today & feeling even better that l managed to get a great sleep considering it was colder in the lodge than it has been camping the previous nights. The lodges up at this height are not exactly your 5 star accommodations, very cold, food is not always the best & the worst thing is you can’t ever expect to enjoy a warm shower or even a clean toilet. There are no showers & the toilets smell worse than sewage. 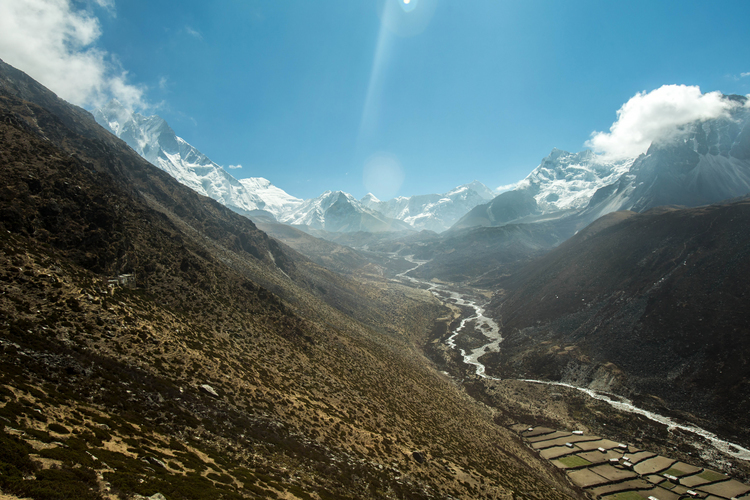 Let’s get back to the positives - wakey wakey 5.15am, breakfast 6am, and then start our trek towards Gorakshep 5,164m (Gorakshep was originally Everest Base Camp, that was used by the Swiss Mountain Climbers to attempt Everest in 1952). I quickly eat breakfast with urgency so we can get to the trekking, l’m dying to get moving. 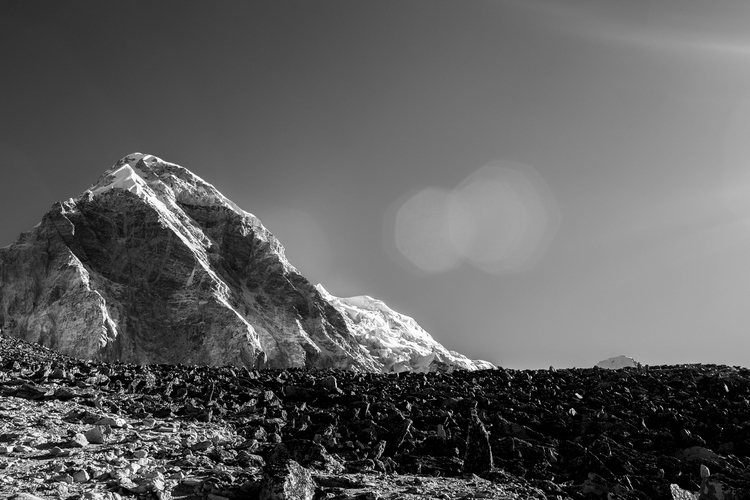 Today is going to be tough, going from Lobuche 4,930m to Base Camp 5,360m will be a real challenge with the altitude. The trek starts off with a gradual incline as my footprints make a crisp noise walking on the freshly laid snow, the air is cold so l have to make sure & keep my mouth covered. I’m about 30 minutes in, my legs are feeling real heavy, minor headache & a shortness of breath. The cold air and the altitude isn’t helping in the slightest. From my previous days trekking & feeling the altitude l decide to slow my pace down, l want to make sure l’m in fit shape for when we reach the other lodge we will be staying in at Gorakshep for the night, plus l want to be super healthy for when we make it to Base Camp today. It has taken me about 2 hours to reach Gorakshep Himalayan Lodge & Restaurant. I’m feeling somewhat fresh & happy with myself for slowing down my pace considering we have at least another 2 hours to go until we reach Base Camp. While at the lodge, l get all my gear off & stored away in our room then enjoy a nice warm lunch of vegetable soup with some bread. After about an hour of relaxing & warming up it’s time to depart to Base Camp, the time is 10.30am with us expected to reach base camp around 12/1pm. The sun had come out but the weather was still very cold, l put on my North Face Point Five Red jacket (http://www.tiso.com/mens/jackets-coats/waterproof-jackets/) I love this jacket not only because it’s red, it’s super reliable against protecting you from wind & any water trying to sneak in also the pit vents are great for on the move when you don’t want to change the jacket but get good airflow so you don’t get too sweaty. The walk is gorgeous, l legit feel like l’m walking into an image from a postcard - the scenery is breathtaking. The Gradient is a steady incline with the majority of the path being flat & rocky. Whilst taking my time catching my breath I’m also taking some photos hoping that l can capture all. The beauty around me is extremely hard to capture, experiencing everything for what it is now is something that is very difficult to photograph on camera. 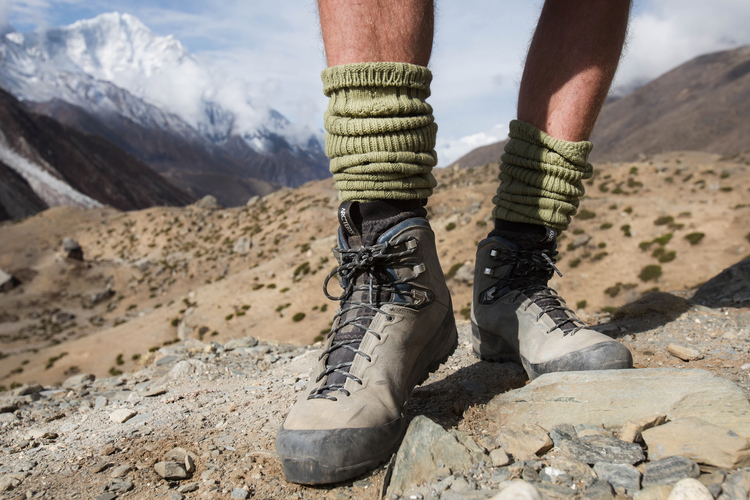 I do my best & decide to trek on, the feelings as l’m getting closer & closer to Base Camp does not seem real. I can see the camp in the distance giving me the chills, it’s as if l’m waking up from an awesome dream thinking - “Is this real? Am l actually about to make Base Camp Everest in the next 20minutes?’ It’s all very surreal. I’m trying not to push myself so hard because that one little thing called altitude is creeping in on me, l can feel my body fighting it but not winning. Tristan Harper 1, Base Camp Everest 0, l have made it. High fives, hugs, even hugging strangers that have made it to Base Camp. The feeling was real, l can officially now say l have made it to Base Camp Everest. Our group got really lucky, one of the sherpa’s in our group has a cousin who is working at one of the tents for a Belgian team who are currently at Camp 4 expecting to summit Everest, they were meant to summit today but due to weather not being perfect they had to wait it out. We got the privilege of hanging out in their tent while enjoying some tea & biscuits, learning as much as l could about what it was like living at base camp. (Teams tend to stay at Base Camp for about a week, then they will spend three to four weeks going up & down the mountain to establish camps with food, fuel & oxygen. The summit push can take up to about a week from camp 4 depending on the weather, it can take a total of six to nine weeks depending on the situation). After enjoying our time at the Belgian’s tent we then started our walk back to Gorakshep where l can rest up, getting ready for our last big trek of my expedition to hike Kala Pattar 5,365m. 19th May - Kala Pattar Hike 5,365m. During my whole expedition & after completing Base Camp Everest l was most worried about doing this hike to Kala Pattar purely because of how high l will be & having already felt the effects of the altitude. We were up super early today so we could catch the sunrise while ascending Kala Pattar which was expected to take 2/3 hours straight up with zero downhill or flat ground. The trek from Gorakshep 5,180m to Kala Pattar is only 5,365m, it’s nothing in the grand scheme of things which l’m constantly reminding myself of but l just can’t seem to shake off how much the altitude is affecting my body & how incredibly weak l feel. The best thing l got going for me is my mental attitude, keep reminding myself that l can do this but equally know this hike is going to be a killer. The exhaustion after all these days of trekking is catching up but as l’m just getting to the top of Kala Pattar feeling the incredible burning of my legs & having to catch my breath every 5 minutes. l make it with the incredible rewarding feeling of euphoria wash over my whole body. 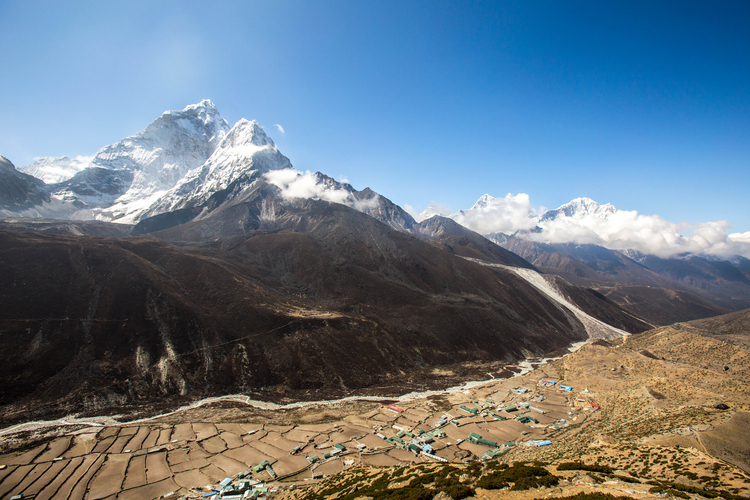 The views are incredible especially as the sun is rising over Everest. Everest is so large that it is blocking out parts of the sun causing almost stream effects of light throughout the sky. I find sometime for myself sitting on a rock taking in all the beautiful sights before heading back down to Gorakshep where we enjoyed some delicious porridge before we start our final descent towards Lukla over the next 5 days which will mean an end to our trip. This experience for me has changed my life especially how it’s beginning to shape, certain pathways l have always been ambitious about. This trip has been extremely positive for me not only being around the beautiful people of Nepal but on a personal level, l have a better understanding of who l am & where l want to go in life. l have always had a passion for being outdoors and this is where l feel most energised. l now have further determination to summit Everest one day but in the meantime l will be eyeing up smaller peaks so l can gain more skills, knowledge and eventually become a professional Mountaineer. 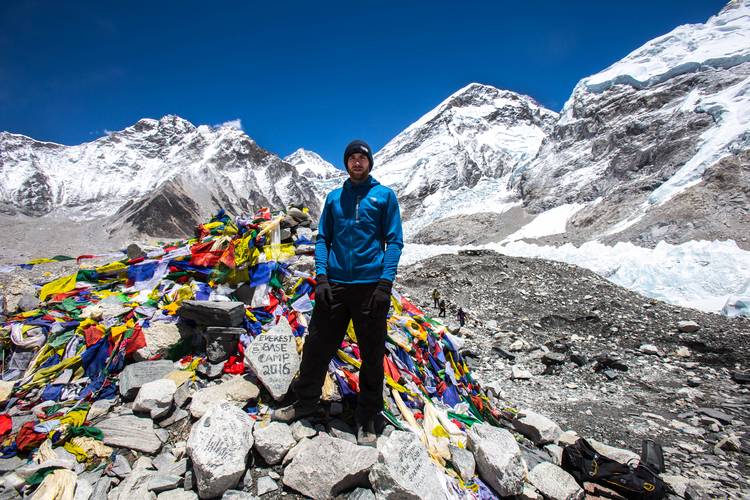 Thank you everyone for reading my blog on my adventures to Base Camp Everest. l could not have done it without the support from my family, friends, Tiso, The North Face & with the mental/physical determination that being a professional Ice Hockey player has taught me over the years. Sending you much love & good vibes.